The relative of a Chawkbazar fire victim accused two owners of 'Haji Wahed Mansion' in a case on Thursday night, a day after a devastating fire claimed about 78 lives, police told. The case was filed with Chawkbazar Police station accusing two brothers Sohel and Hasan, told duty officer of the police station. Inspector Muradul Islam is investigating the case, he added. 78 were killed and around 41 others injured in a fire that broke out at a chemical warehouse and raged through four other adjacent buildings in Chawkbazar on Wednesday night. 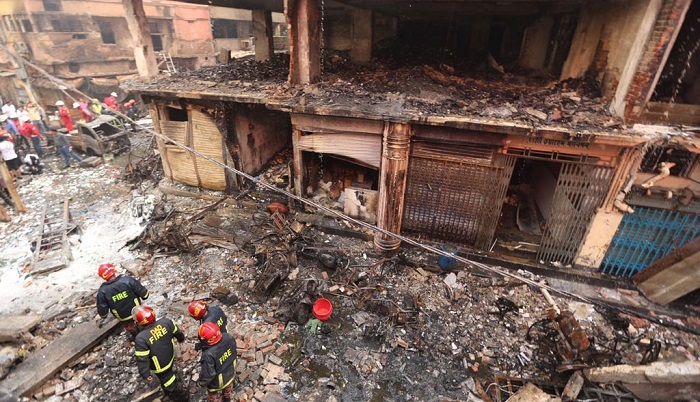 A Dhaka South City Corporation investigation body said the fire spread fast as chemicals were stored in Wahed Mansion. Meanwhile, Sub-Inspector Delwar of Chawkbazar police filed a separate case against unidentified people on Thursday night over the fire incident, said SI Abdul Halim.